Preface: this story was reported and written in late 2006 and early 2007 after some of the worst riots in Mexico broke out in the idyllic city of Oaxaca. “Your life will be in danger,” my friend Bill had told me the afternoon of my flight to Oaxaca in early December. His warning was bracing. Traveling in the shadow of fear was nothing new to me; after all, I’d just returned from Iran. But direct danger? I called another friend experienced in situations like these, especially Mexico. The next afternoon I was in Oaxaca. My taxi from the airport followed a truck filled with soldiers down Avenida 20 de Noviembre. As the truck stopped my cabbie said, ” Su hotel, señor,” pointing at a clean, traditional square inn with purple borders and neon sign saying Hotel Francia to his left. In between dodging several pedestrians and grabbing my bags, I saw gunmetal black and gray hanging on the back of the rearmost soldier. Tension hung over the crowded street. The story of how Oaxaca, a city surrounded by verdant mountains of pine and streets full of elegant colonial architecture, fell from the pinnacle of Mexico’s tourism industry into its basement began in May 2006 when the annual Oaxaqueño teachers’ strike raised the ire of the state’s blue-blood governor, Ulises Ruiz Ortiz. 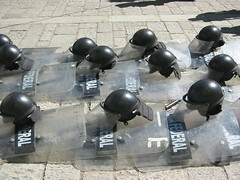 In June he sent in the state police to disperse the teachers. The police action quickly turned violent; eight people were reported killed (although this claim has since been corrected, it was important in galvanizing public opinion in Oaxaca), and more than 100 were hospitalized. As news spread, Oaxaqueños from all over the region converged on the city and fought off the police, regaining control of the city square. Two days later, an estimated 400,000 people marched in support of the teachers’ union. A unified movement of almost 200 diverse groups within the state of Oaxaca, calling itself the Asamblea Popular del Pueblo de Oaxaca, or APPO, demanded Ruiz’s resignation. A six-month long confrontation ensued, frequently violent, sometimes murderously so, between those without the power to decide for themselves and those with the power. One casualty that suffered in silence was Oaxaca’s tourism industry. The morning after my arrival I wandered through the streets of Oaxaca. The angry crowds were gone, their chants but an anguished echo in the valley. The gardens of the zocalo, Oaxaca’s town square, were filled with poinsettias, each with a small card attached to it, a spontaneous peace offering from the city’s families, rich and poor. 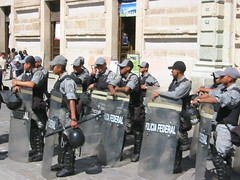 Large armored trucks topped with water cannons guarded the main entrance to the zocalo. Soldiers uneasily pitched tents under the colonnades of the Hotel Marques Del Valle, under the shade of the huge trees in the Alameda de Leon and beside the northern wall of the cathedral. 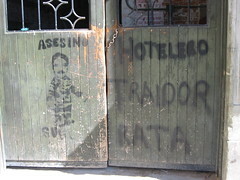 Squads of gray-clad Federales marched up and down the Alcala Oaxaca’s main tourist thoroughfare while shopkeepers swept up broken glass and laborers, rushed in by the governor, hurriedly painted over the ubiquitous graffiti. 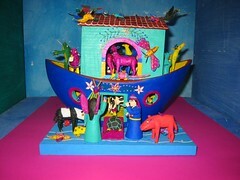 Old ladies carried baskets full of pastel Aztec calendars and little boys ran around selling chicle. Here was Oaxaca in the aftermath: colorful, full of beauty but marred by reality. The big question on the minds of most Oaxaqueños was: Will the tourists return? And if so, will it be safe for them? My search for answers begins at Amate, an American owned, English-language bookstore that has the finest collection of books in English on Mexico I have ever seen. The owner, Henry Wangeman, greets me. He has blue eyes, graying reddish hair, an identically colored beard and a warm handshake. We sit down in a cafe above his bookshop. Santo Domingo is off to my right and I get lost gazing at the mountains in the distance as Henry starts talking. “(Felipe) Calderon (Mexico’s new president) has a chance to unite the country,” he says. “Is the government that bad?” I asked. “There is no accountability or openness in the Oaxacan government. The caciques, the aristocracy heavily entrenched here in the state, aren’t going to let go,” Henry replied. An example of too much government interference, according to Henry , is the Botanical Gardens of Oaxaca. Originally set up as an independent organization to conduct research on and show off the local flora, the government “swooped in” when the gardens showed revenue potential. What was once a vibrant, indigenous expression of curiosity and entrepreneurialism is now just a place full of pretty flowers for people to have their wedding pictures taken. Henry had a laundry list of other issues he wanted to talk about, ranging from NAFTA to the old gods that still haunt the villages. Indeed, I could have listened to Henry’s enthusiastic digressions all day, but time was short and I came to the point. He grew thoughtful, and then smiled. Paul Leveno, an expatriate technology worker in Oaxaca, wasn’t nearly as sanguine as Henry. With sandy blond hair slicked back, he had an air of intellectual dissipation about him. “Why do you see it differently?” I asked. But therein lay the paradox of tourism-based economies: stability is necessary to win tourists, but it’s the money tourists bring with them that provides, in large measure, the stability needed to increase tourism. A rising, or at least stable, standard of living is necessary to prevent Oaxaca-like political instability. Luis Marti­nez and his extended family are Zapotec Indians who depend on the traditional carpets they weave for their livelihood. “If there are no tourists, we sell no carpets,” he told me the day we met. Luis’ shop sits further up the Alcala than Amate Books, right in the shadow of Santo Domingo. But Luis lives about 60 miles outside of Oaxaca in the weaving village of Teotitlan del Valle, which I visited the next day. Sitting on the floor of a narrow valley, Teotitlan is about 10 miles off the main southern highway we took out of Oaxaca. The landscape is surprisingly dry, almost semi-arid with plots of agave lining both sides of the road, marked out by rock fences and prickly-pear cactuses. A tangerine tree sits in the yard of Luis’ family home. Saltillo-like tiles adorn the roof of this U-shaped home. The family quarters are off to the left and the weaving wing of the home sits to the right in the shade of tangerine and mango trees. Sylvia, Luis’ cousin, greets us, ushering me into the left wing of the house to sit down. 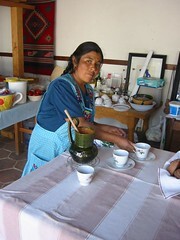 Speaking in Zapotec, an accentless and soft language, Luis translated for her. “It is a pleasure to meet you. We have not had any visitors in many months,” she told me, adding that she hoped I liked the fresh chocolate drink and pastries she prepared. While talking she whisked the chocolate up into a froth that would have made any Starbucks barista ashamed. “Business has been bad the last six months?” I asked Luis. “Yes,” he told me, pointing to several beautiful carpets lining the walls, “all of these carpets are what you call, surplus. They are good carpets, of excellent quality,” he said. “I have won many awards in the United States for the carpets we weave here,” he added, showing me several certificates and photos of a much younger and more ebullient man. 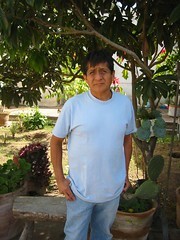 After his parents’ death a few years back Luis became the patriarch of his family. Now he runs the business, provides a home for his unmarried cousin and money for many other family members. He balances the books, and also ran, before the present troubles broke out, a village co-op, which brought tourists (and their precious dollars) from Oaxaca out to Teotitlan. The difference between the man in the photos he showed me and the man before me reveals a person consumed with worry. The politics of the unrest clearly affect Luis and his family, and on the drive back, I was determined to learn Luis’ views. “Do you feel like the APPO represents you and your family’s interests?” I asked. Luis’ answer was ambivalent, at best, but hardly hostile. He seemed more bewildered by a wild storm he little understood, only wanting to steer his family business safely to port. “Will things get better?” I asked him. The rest of the ride was quiet, each of us lost in our thoughts, until we arrived back at my hotel. I offered Luis my thanks for a wonderful day. As I wandered back through the streets of Oaxaca one last time I saw the poinsettias in the zocalo garden and thought: If anything is proof that it’s safe for tourists to return, this yearning for peace among the city’s families is it. 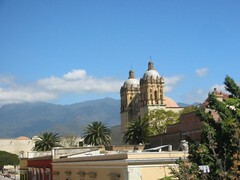 Besides, with so few tourists, Oaxaca is a bargain. This story was originally published in the San Antonio Express-News print edition in January 2007. This entry was posted on Friday, August 30th, 2013 at 6:03 pm	and is filed under Mexico, Never Ending Narrative. You can follow any responses to this entry through the RSS 2.0 feed. You can leave a response, or trackback from your own site.